Erin's degree is in Hotel/Resort Management from Florida Southern College, and her background has been in restaurants, country clubs, golf courses, hotels, and private condominiums. Most recently, she was Team Lead in Financial Aid at Full Sail University for 8 years. 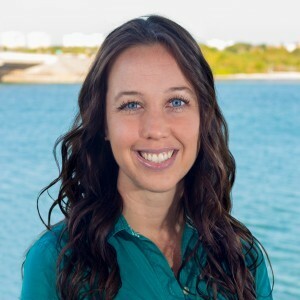 Being born and raised in central Florida, she has always had a passion for sea life and ocean conservation. Erin is an avid scuba diver and has her rescue diver certification. She is the Executive Coordinator for Southwest Florida Women's Dive Club and also volunteers at local animal shelters. Prior to being hired, Erin was a volunteer in the Marine Mammal Center.